Nephi, the brother of Jared, and Moroni all commented on sealed or sealed-up portions of the Book of Mormon, the brother of Jared's vision, and Moroni's abridgment of the brother of Jared's writings. Sealed (hatom), as used in Jeremiah 32, has various meanings. Hatom means literally that a seal has been placed on a document, but it also implies that the document may be "unavailable" or "complete." Similarly, in their discussions of the sealed portion of the Book of Mormon, Book of Mormon prophets generally used the termsealed to express that a document was literally closed with a seal and sealed up to indicate that a document was unavailable. 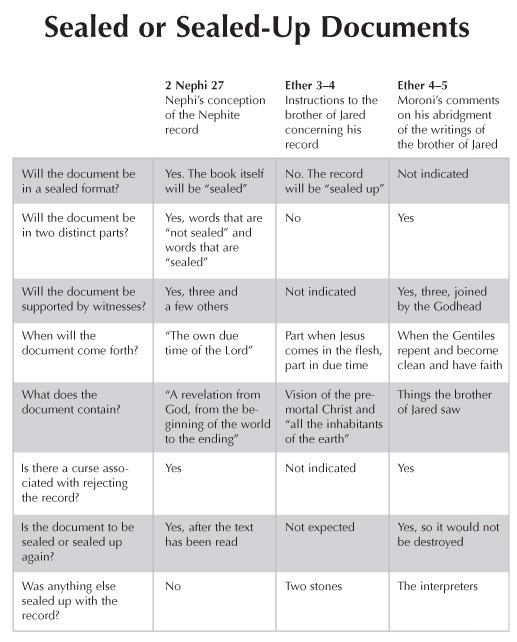 Knowing these definitions can help readers follow the accounts in 2 Nephi 27 and Ether 3–5.